Nice to see a re-print of the original Freightdog Decals sheet. Four years on an unsurprisingly still only the old Airfix and Hasegawa (converted) kits are available for the subject, which is a real pity as there are some great subjects included. 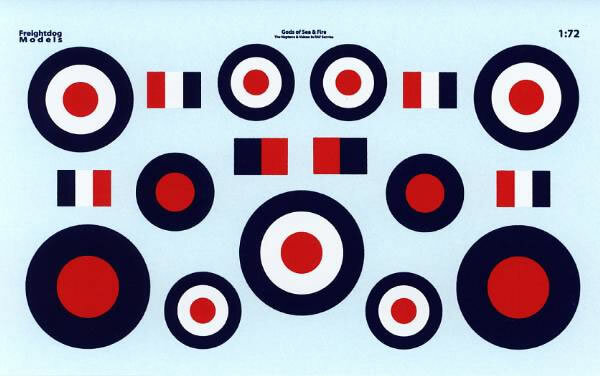 I first reviewed this sheet from Freightdog Models way back in 2007. For those interested go here for my opinion back then. So this begs the question what has changed in the last four years (aside from the price going to GBP 10.00 from the previous GBP 8.50). Well firstly what had been provided as a correction sheet in the original release has now been incorporated on the main A5 sized sheet, being the 36 Squadron green codes and resized squadron markings for the Vulcan subjects. Also included is a new Neptune MR MK 1 subject, this time for 236OCU, RAF Kinloss in 1956. The remaining two Neptune and eight Vulcan subjects (from six airframes) carry over from the first release. Vulcan XM607 of 44SQN in an earlier guise in 1977 when attending Exercise RED FLAG at Nellis AFB. Unusually this Vulcan received a tan and brown disruptive scheme on its underside for this deployment. As per the original sheet, this sheet appears to have been printed by Fantasy Printshop and are very well printed, being very thin with minimal carrier film and all images in very good register. 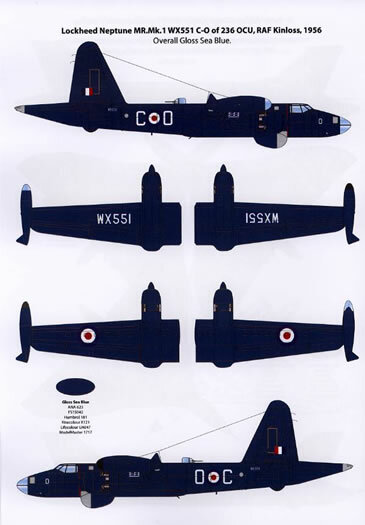 A separate sheet now carries most of the national markings now required for the included subjects and provides enough roundels and common markings for several models to be completed. Back in 2007 my major criticism was a lack of explanation of the correction insert and instructions for the airframe stencils provided on the sheet. 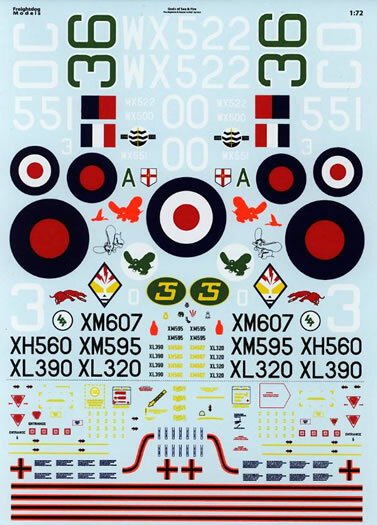 As now noted in an insert, the stencils match the Airfix kit and as such the Airfix kit instructions can be used to guide placement, whilst all other corrections are now incorporated in the main decal sheet, removing the need to figure out which is the correct design to use. Freightdog also notes that modifications for the Airfix Vulcan, especially the Olympus engine exhausts are now available direct from them, making building all the subjects easier. Freightdog has done a great job refreshing this their earliest release. Shortcomings from the previous sheet have been addressed and in doing so the space has been created for a new subject to be included. I am a great fan of Freightdog and their imaginative choice of subjects, and this sheet amply demonstrates what a range of interesting subjects can still be found for old but readily available kits such as the Airfix Vulcan and Hasegawa Neptune, with appropriate conversions.